The thick, large tail of a Sperm Whale heads to the depths of the ocean off the Kaikoura Coast on the South Island of New Zealand. The tail is the last thing you will see of this Sperm Whale for awhile as he heads towards the darkness of the deep waters off the Kaikoura Coast on the South Island of New Zealand. A Sperm Whale can dive to depths of 3,000 meters but an average dive is about 400 meters where he usually remains for thirty to forty-five minutes. Once a Sperm Whale surfaces he will remain there for about eight to ten minutes which gives you plenty of time to snap some photos. 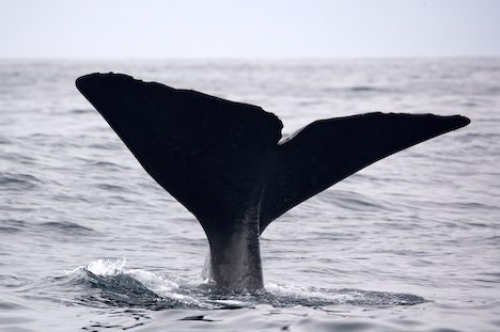 When the whale is ready to dive again, the head and body will disappear first and the massive tail will then slowly sink beneath the water's surface. You can scour the ocean's surface patiently waiting for the Sperm Whale to resurface but in the time span that they are out of sight nobody knows which direction they head or at what speed. Always keep your eyes open as you never know when another Sperm Whale will surface or when another tail will disappear. A tour with Whale Watch Kaikoura on the South Island of New Zealand is always worthwhile as trips head out daily to see the Sperm Whale in its natural environment. Unfortunately, nothing is for certain in life and even more so with these wild sea mammals.